New food products and trends are inevitable as people and “foodies” become more interested in health. 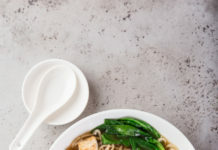 Exploring food not only opens up the door to discover unique flavors, but an opportunity to obtain valuable nutrients and health benefits. Discover one of the many distinctive foods here – the carambola fruit! 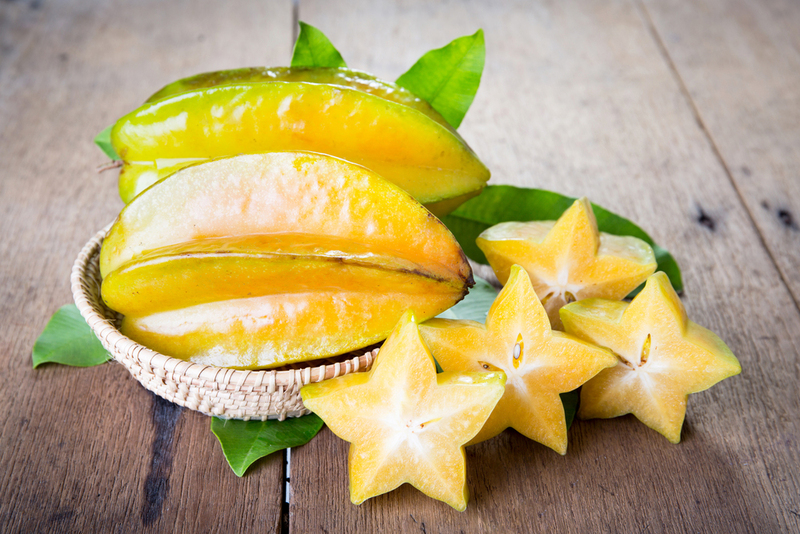 Carambola is essentially an unfamiliar word for star fruit. The fruit is produced from Averrhoa carambola, a tree species cultivated throughout several tropical and warmer climate areas, including Asia and Malaysia. The fruit dangles and grows from the tree limbs alongside the leaves until ready to become harvested. Star fruit season depends mostly on the region, but commonly produced in the spring to late fall and harvested mostly from June through February. Star fruit receives its name not necessarily from its initial exterior appearance, but the star it resembles once cut into. Its taste is described by a light grape and pear flavor with an exceptionally juicy center. 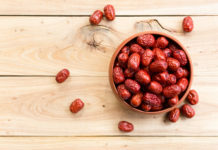 Besides the seeds inside, the fruit is entirely edible (skin and all). But in absence of its physical presence, carambola fruit bears healthful benefits related to its nutritional profile and composition. 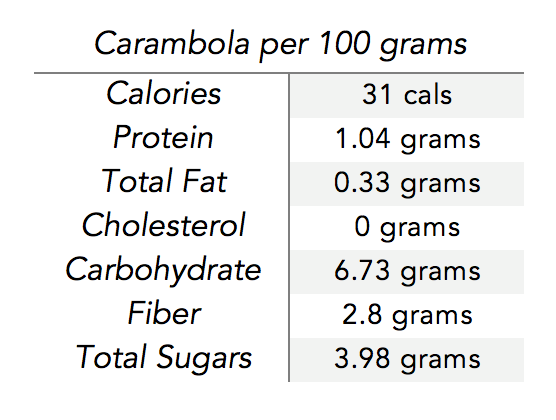 Below depicts a basic nutritional profile of carambola based on 100 grams. To put that amount in perspective, the following numbers compare common servings sizes (also in approximate grams) to the 100 grams mentioned: small (3-1/8” long) or 70 grams, medium (3-5/8” long) or 91 grams, and large (4-1/2” long) or 124 grams. As indicated above, star fruit is low in calorie while offering dietary fiber. The combination of keeping calories in balance and increasing fiber encourages both weight loss and maintenance. Fiber is praised for its function in digestive health. The fiber content found in carambola contributes to total daily fiber content and promotes bowel regulatory. Fiber further reduces the likelihood of gastrointestinal conditions including hemorrhoids. Mostly related to the antioxidant properties of vitamin C, star fruit may combat against disease. Rich antioxidants help protect the cells against damage, with healthy cells withstanding against disease including heart disease and cancer. And if weight is within a healthy range, the risk of disease is further reduced! Cataracts are when the eye’s lens becomes cloudy and may result to blurred vision and potential blindness. Vitamin C is now “looked” upon for its role in cataract prevention relative to its high antioxidant properties. Find out more on the link between vitamin C and cataract risk here. Once again, vitamin C steals the show. Further benefits of star fruit’s vitamin C content can boost the immune system. A robust immune system fights strong against the flu, cold, and other body infections. Though not scientifically established, star fruit has been suggested to increase milk production and flow in breastfeeding moms. This natural benefit can reduce stress and anxiety related to diminished milk production and nurture the bond between mom and baby. Recommendations suggest star fruit consumption can be extremely harmful to individuals suffering with a kidney, or renal, condition (kidney failure, kidney stones, and those receiving kidney dialysis treatment) mostly related to its high levels of caramboxin and oxalic acid content. The compounds have shown to be highly toxic and may provoke seizure, confusion, and potential death. Carambola may also interfere with certain medications. Checking with a healthcare professional can best guide and avoid a medication interaction.